Fall asleep to the sounds of the forest and the river cascading below.... and as dayolight arrives, wake up to an orchestra of bird song and the distant call of Howler Monkeys. Nestled in the rainforest on the banks of the Rio Tigre, not far from the eastern boundary of Corcovado National Park, Bosque del Rio Tigre Lodge gives visitors the distinct sense of living in a tree house. Hummingbirds, woodpeckers, tanagers, motmots, kingfishers, and dozens of other species keep birdwatchers grabbing their binoculars without even leaving the lodge. The lodge is a labor of love, built and operated by American naturalist Liz Jones and her Costa Rican husband Abraham Gallo, who lead tours, lend binoculars, and pamper guests with a level of service that is rarely experienced in the most exclusive facilities. The 31-acre private reserve connects with several other private reserves and offers extensive hiking trails, creeks, lagoons, waterfalls, and abundant birds and wildlife. Abraham Gallo is one of the best birding guides we have ever traveled with and his life-long experience on the trails of the Osa make him an ideal companion for longer expeditions including the day-long trek across the peninsula to Carate. Pick up from your hotel in San Jose and transportation to the domestic airport. Fly SANSA airlines to Puerto Jimenez on the Osa Peninsula, where a driver waits to take you on the half-hour ride to Dos Brazos and the Bosque del Rio Tigre lodge. 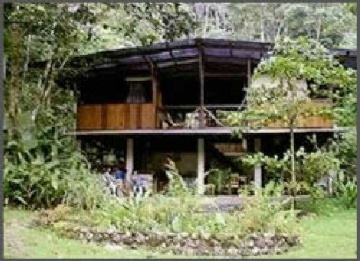 Accommodations with all meals, snacks, fresh fruit juices, transfers to and from Puerto Jimenéz, use of binoculars, spotting scope and reference library and excursions including a 5 to 7 hour primary forest hike, 2 1/2 hour morning bird walk, 2 to 3 hour afternoon nature walk, and1 hour night hike. Return transportation all the way back to your hotel in San Jose. You can choose whether to return immediately or spend a few more nights on the Osa enjoying the beautiful beaches of the Golfo Dulce or perhaps connecting to a lodge on the Pacific side of the peninsula. All Inclusive Price from San Jose: $625 per person double occupancy.